Use these parts to add your own circuit to a PC/104 system, or to add a PC/104 module to your own custom board. These are the same headers used on all our PC/104 modules and are guaranteed to be compatible with any PC/104-compliant header. 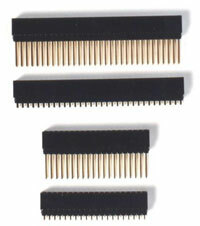 Order 64-pin (8-bit main bus) and 40-pin (16-bit bus extension) components separately. Standard headers shown are stackthrough, allowing you to mount a module above and below. Non-stackthrough headers have the female socket on top and solder tail pins, allowing you to mount a module on top only. The 8-bit (64-pin) header is required on each PC/104-compliant or PC/104-compatible circuit board. The 16-bit (40-pin) header is optional and is not used by all modules. All of Diamond Systems' PC/104 modules come with both headers. We now offer PC/104 spacers for board mounting. These .600" length spacers are a non-standard length and can be hard to find in small quantities. Order either in bulk quantity (4 per board required) using SPC-104, or as the MTG104 single-board mounting kit. 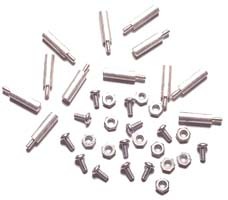 The kit includes 4 each spacers, #4-40 x 1/4 screws, and #4 nuts.